All 108 species of Dragonflies and Damselflies found in CA included. 40 full-color plates with beautiful illustrations by Tim Manolis of all species. Painting show males, females, & immatures in suitable habitat. Addtional black & white line drawings illustrate difficult ID marks. Authoritative text describes males, females, immatures, habitat, behaviors and life histories. Range maps show geographic distribution. 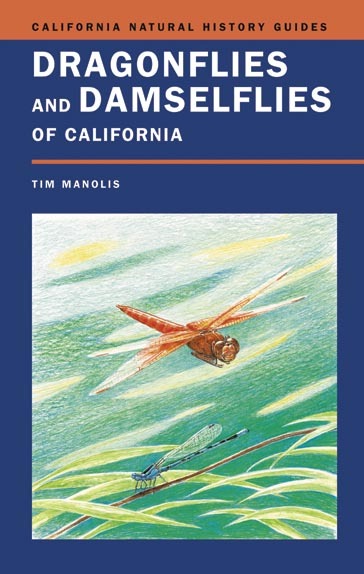 The Dragonflies and Damselflies of California is the first comprehensive guide to finding and identifying all of the 108 species known to occur in the California. It provides a general overview of the dragonfly body plan and life history, as well as information on how to watch and study dragonflies in the field. Accounts of each species discuss identification in the field and in the hand, behavior, habitat associations, geographic distribution, and flight season. Forty full-color plates and additional black and white figures illustrate identification marks for all of California's dragonflies and damselflies. A complete set of range maps and a checklist are included as well. Buy from us or buy from Amazon.com. "This attractive book, with its beautiful paintings and authoritative text, should be in the library of all Californians interested in nature." We've used PayPal for 10 years and it has worked flawlessly, plus it's a GREAT way to do International Business!